Home » Uncategorized » Why Do Americans Take So Few Vacations? Why Do Americans Take So Few Vacations? Compared to our European and Australian counterparts, we Americans are workaholics who take very little time off. Amazingly, the United States is the only developed country in the world that does not require employers to give workers any paid vacation days. Almost 1 in 4 working Americans do not receive any paid vacation or paid holidays. The Center for Economic and Policy Research released a study last year comparing labor laws in regard to paid vacations and holidays in 21 developed countries, including 16 in Europe and Australia, New Zealand, Japan, Canada and the USA. – Workers have no legal right to paid vacations or holidays. – The average paid vacation and paid holidays provided to American workers who received paid vacation days totaled 16 ― This did not even meet the minimum required by law in 19 of the countries researched. – U.S. law does not require employers to give workers any any paid holidays, compared with the other countries on the list, which provided 5-13 days a year, in addition to paid vacation time. – Workers in Europe are legally required to have at least 20 paid vacation days a year, with some countries providing 25 or more – In France the national average is 31 paid days off per year, in Austria it’s a whopping 38 days. – Japan and Canada legally require workers to have at least 10 days of paid vacation a year. – Five countries that were researched even require that employers pay workers taking vacation days a premium above their standard working pay in order to contribute to vacation expenses. Many Americans don’t even take their earned vacation days. According to an Oxford Economics Assessment of US workers’ paid time off,, American workers left 429 million days of paid vacation unused in 2013 – 2.4 days per person. Studies have been made that prove that not taking vacations is detrimental to your performance at work and to mental health. 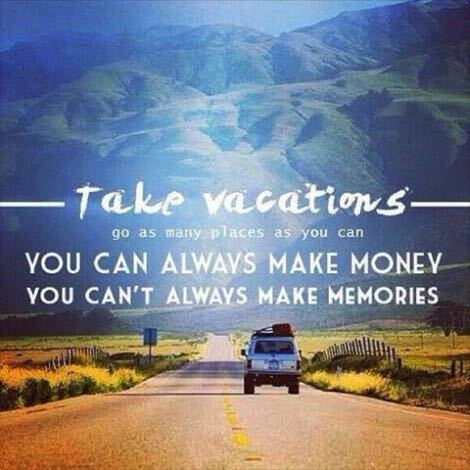 If you have accrued vacation time, take it! Travel… explore… see the world! Nobody lying on their death bed looking back on their life ever wished they’d taken fewer vacations! The politician who can give more time off to Americans gets my vote! I desperately need one. Great article, this inspired me to contact you for my next vacation. Thanks a lot, talk to you soon!!! Thanks Samantha! We agree, change at political levels is needed.